I like beer and babies. 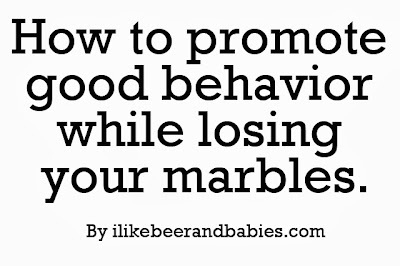 : How to promote good behavior while losing your marbles. 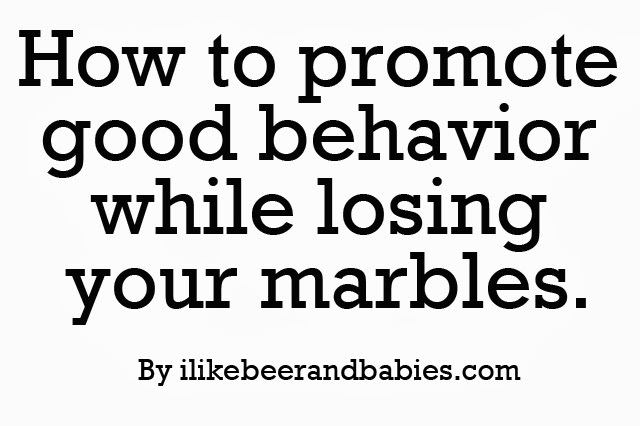 How to promote good behavior while losing your marbles. Lately our kids' problems with sharing, whining when asked to do simple chores, talking back, etc., have caused my husband and I to figuratively lose our marbles. My solution? To literally lose them. We have established a marble jar system to reward good behavior and the results have been amazing. Show your child(ren) the two jars and the marbles. Explain to your child(ren) that when they do something good from now on, they will get a marble in their "Superstar Jar". Let them help you pour the marbles into the starter jar. Talk to them about a reward they would like once they move all the marbles to the Superstar Jar (it should be something small, like going out for ice cream or getting a small toy). Get started: when your kid does something good, move a marble from the starter jar to the Superstar Jar. Once the Superstar Jar is filled, give your child their reward and talk about how proud you are of them. Talk with your child about what they would like their next reward to be. Have them help you move the marbles back to the starter jar. Reward good behavior often. Being stingy with the rewards makes your kid get bored of the whole thing with a quickness. Aim to empty the jar within a week or two so they stay excited about it. No Indian giving on the marbles. Once they are earned, they can not be taken back for bad behavior. Kids are not allowed to ask for marbles if they do something good. They have to be earned without asking. This is a great way to encourage sharing and relationships between siblings. It also helps older children feel special when they get to do something their younger sibling can't. It has encouraged our daughter to be nicer to her younger brother, share more and help around the house--all without being asked! It can also help with potty training and breaking bad habits.